Make the most of your time in Florence with this Combo Saver tour covering all of the city’s iconic sights in one day. Skip the line at the Accademia Gallery to marvel at Michelangelo’s David; gaze up in wonder at the great red dome of Il Duomo, Florence Cathedral from the outside; and explore the streets of the historic city center with insights from an expert guide. Then, skip another line to end the day with a comprehensive tour of the immense Uffizi Gallery. Please note: Currently, numbers are limited to 25 on this small-group tour, but from March 1, 2019, this tour will run with 14 people maximum. Skip the long lines at Florence’s two most popular museums with this great-value Super Saver. Start the day with skip-the-line access to the Accademia Gallery, home to Michelangelo’s David. Nothing prepares you for the scale of this sculptural masterpiece. Your guide will help you appreciate the artistry from every angle, including the techniques Michelangelo used to make marble look smooth as butter. The highlight of the city walking tour is the Florence Cathedral, whose incredible red dome is the city’s crown jewel. The dome was not without challenges for architect Filippo Brunelleschi, as your guide will explain as you view the masterpiece from outside. Entrance to the Duomo is always free, so you can come back at any time to explore the cathedral in more depth, equipped with an abundance of knowledge shared by your expert, local guide. 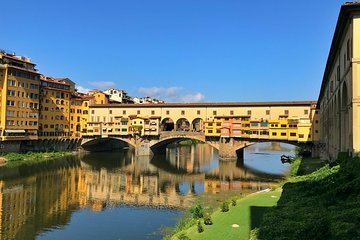 Your tour continues through the historic center of Florence, taking in the Ponte Vecchio bridge and the Piazza Signoria, where David once stood. After a break for lunch (be sure to ask your guide for recommendations), you’ll skip the line once more at the Uffizi Gallery. Your guide will lead you on a carefully planned route through this immense gallery, wasting no time in showcasing works by Da Vinci, Botticelli, and Titian. Don’t forget to rub the nose of Il Porcellino, Pietro Tacca’s Baroque bronze boar sculpture, to bring the rest of your vacation good luck. Whether you’re only in Florence for a day or settling in for a longer stay, this is the perfect introduction to a city where beauty awaits around every corner. Angela, our tour guide in the morning was excellent with clear English and was very knowledgeable about the Accademia. She was also a great storyteller. Our guide in the afternoon also spoke excellent English and taught us a lot about the art in the Uffizi Gallery. She was very knowledgeable and made our afternoon enjoyable. It was an excellent tour. He gave us a great tour, lots of history and anecdotes along the way. I would highly recommend this tour and ALWAYS pay for skip-the-line tickets! We had Stephanie for a guide and she was excellent. A lot of walking over uneven surfaces, but worth it. We took the 08.30 tour initially. We didn't have to queue, except for security screening. The guides were pleasant and knowledgeable. We didn't get to go inside the Duomo, but I'm not sure whether that wad a part of the tour or not. It was a public holiday weekend, so the opening times were different. We had a morning session and an afternoon one. Our guide for the walking tour was excellent and this part of the tour was a 5. The afternoon session, which was the Uffizi Gallery was very good but not quite excellent. We think that, while the guide was good very knowledgeable we felt a little bit rushed. Angelo A. really made this tour fantastic. When I first thought visiting the gallery's I thought oh great old paintings. Angelo made them into art. The way he spoke about them and told stories about the art. Really made you appreciate the paintings. Would recommend. Very informed guides......These were two tours put together. First just Uffizi in the morning with one guide and then after a break around the city and Accademia with another guide. They showed us all the highlights.....it was perfect! Wear good walking shoes....it is a long day on the feet! If you are going to Florence and care anything about seeing the Art that helped changed the world then this double museum tour package is a must. From the Middle Ages art and artists to the greats of the Renaissance, you see them all. Painting to Sculptures. David to Venus. This tour covers all aspects of the centuries that revolutionized thinking. It is truly an Art History course in a day. Beatrice and Daniella were well versed in their subject knowledge, fascinating to list to and really loved what they were doing. Group size very reasonable and we both were very happy with the entire tour. There was so much in the museums but I can't forget that the other places we saw on the walking tour were just as amazing. Dante's church and home, part of the Medici's Palace, the Domo, Ponte Vecchio and more were just as amazing. Great value for your dollar. We highly recommend this tour but it does make for a very long day so be prepared. Knowledgeable and enthusiastic guides made morning and afternoon tours brilliant Uffizi gallery especially worthwhile.